Back to School is a time of the year that brings many challenges for families, one of the biggest ones being packing school lunches! Desi moms, like any other mom, worry about what to pack for their children in their Desi Lunch Box. What makes our concerns unique is that we try to adapt south asian/desi dishes for lunch boxes so that the children are well-fed during the long day at school with familiar food. 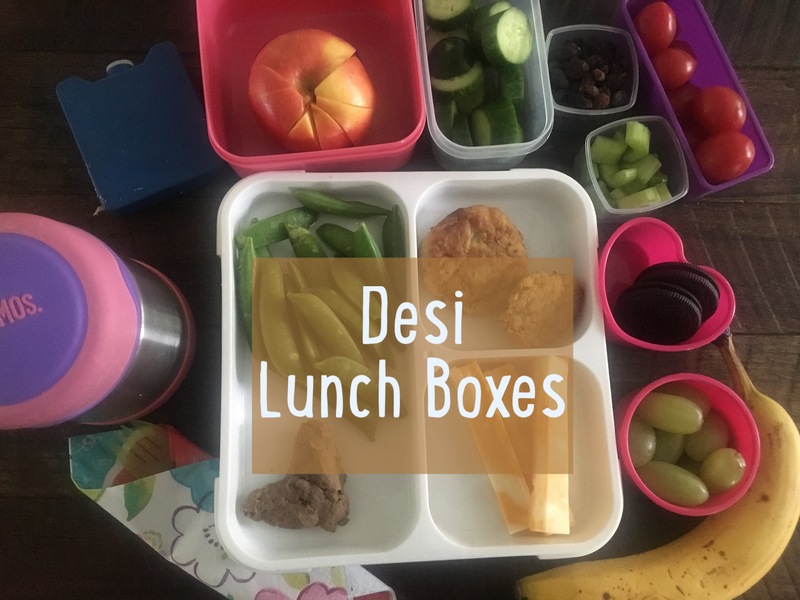 Sharing ideas and inspirations to make your Desi Lunch Box unique and nutritional. Let’s talk first about essentials for a lunchbox. You don’t need to buy expensive products. Concentrate on functionalities. You need one box or bag to contain all the lunch items. Smaller boxes and ziplock bags to contain individual items. Cutlery like spoon and fork along with a napkin. Avoid items other children might be allergic to such as nuts etc. Try to have a nutritious mix containing proteins, carbs, dairy, fruits and vegetables. Adding one treat item can be motivating for children. Plan weekly lunch boxes before you do groceries so that you can plan and shop before hand. Most schools require lunch and a snack to be packed for the day. Here are some ideas for 30 days that you can use for inspiration. For additional ideas, you can mix and match items from below. Cut the apple slices and band together to avoid the apple slices to go brown. You can also sprinkle the slices with lemon or sugar. Make sure parathas are small for easy handling. The parathas can be made more healthy by adding chia seeds and flax seeds in the dough. Use cookie cutters for fun shapes. I make butter toast sandwiches and cut them in tiny squares and call those fairy sandwiches! Add butter on a regular roti and add stuffings like leftover chicken etc. Make sure you wrap nicely to avoid messy spillovers. Hope you enjoyed these ideas! Do let me know how your new school year is going! Previous Post 5 Tips to Rock the School Run Look! I enjoyed reading all your ideas, was more impressed I knew what all of them were:) I made potato cutlets for dinner tonight since they are my sons favorite. I admire your culinary adventures and knowledge! Spread Pizza sauce on frozen tandoori naan, sprinkle shredded mozzarella cheese (add any toppings if kids like, e.g. chicken, qeema, pineapple, olives, capsicum)), or leave it like that for cheese pizza!). Toss in oven and grill for 5 mins or until light brown on top. Instant pizza lunch is ready! I wrap it in aluminium foil to avoid the slices sticking together. Oh nice! What a great idea! I gotta try this. Sounds like a winner. These are great ideas! Thanks for sharing!! This lunch box ideas are really good!! Since my son is not going to school yet, I am thinking of packing myself a lunch for work using these!! So sweet! You’re most welcome! Thank you so much Tamania…I loved these great ideas for lunch. So happy that this helps!